Dumisani Rebombo joined Sonke as One Man Can National Manager responsible for our new office based in Bushbuckridge/Acornhoek, Mpumalanga. Dumisani manages our collaborative community mobilisation study together with the University of Witwatersrand, University of North Carolina in Chapel Hill, and the University of California San Francisco. He was a part of the initial group of people who met to discuss the formation of Sonke in 2006. Dumisani brings many years of experience and expertise as a gender activist to Sonke. Before joining our organisation he worked for The OLIVE LEAF Foundation as their Senior Manager: Programme Development Specialist. In this position, he was in charge of programme design and the management of the Programmes Technical team, including the monitoring and evaluation division. 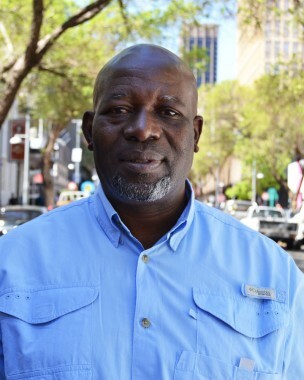 A prominent member of the MenEngage network, Dumisani was appointed Regional Coordinator for East and Southern Africa MenEngage networks, a position he held between 2006 and 2009 while working at EngenderHealth South Africa. Dumisani has delivered presentations and conducted many skills-building workshops at various national and international conferences. He has written a number of publications about his gender activism and has designed and reviewed several gender training manuals and toolkits, including the One Man Can manuals that are now used in Bushbuckridge. He has appeared in countless radio and television interviews and discussions, both nationally and internationally. Dumisani graduated from Damelin College with a diploma in Human Resources Management and went on to study community development with the University of South Africa (UNISA). Dumisani is currently pursuing studies for a Masters degree in Sustainable Development with Staffordshire University in the UK.